I was walking in the woods and saw some things I had not noticed before. 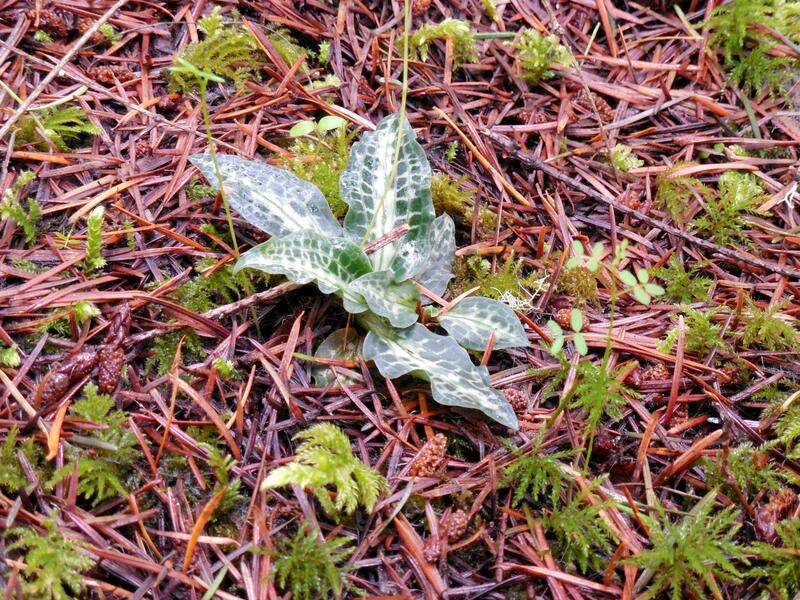 This plant, nestled in moss and fir tree needles, is small now, and I wonder what it will look like when it grows up? It could be a shrub, a vine or a flower. It doesn’t look like anything in my cultivated flower garden, so I’m assuming it is a native. It may be spring before I find out how reliable my mental map of its location turns out, so I can what it looks like as a mature plant. Do you see the plant growing out of the middle of this tree stump? The amount of moss on the stump gives a sign that it was cut a few years ago. (Live trees here do not have much moss growing on the outer bark.) 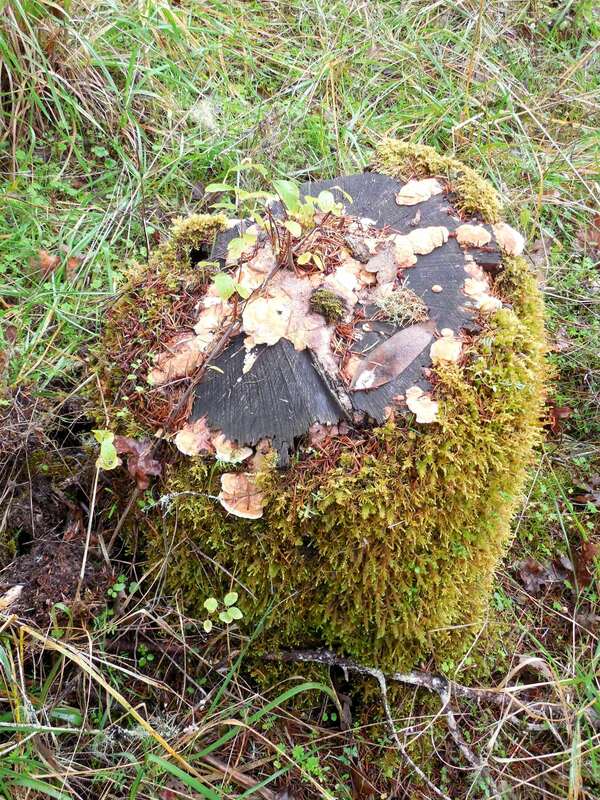 The moss breaks down the outer layers of bark, while the stump decomposes slowly. I followed a vine with my hand, from next to this stump where it started, to the top center of the stump, where it re-rooted in debris that had naturally collected. Did you know that a fir tree seedling can take root in the stump of a cut tree? It can take years, but plant detritus can collect on a stump and the conditions for a seedling to grow and mature can be met. I’ve seen examples of large tree stumps that were moved to downtown Portland, Oregon, and inoculated with seeds. The baby trees are now over 20 feet tall. These trees are in front of the Oregon Convention Center, and have plaques that describe how they were made. While this is well within the range of how mushrooms grow in many places in nature, I have not seen them growing in clumps like this around here. These were good-sized ‘shrooms, and I notice the outer ones appear to be the oldest. I’ll try to check in on them and see if new ones are still appearing. 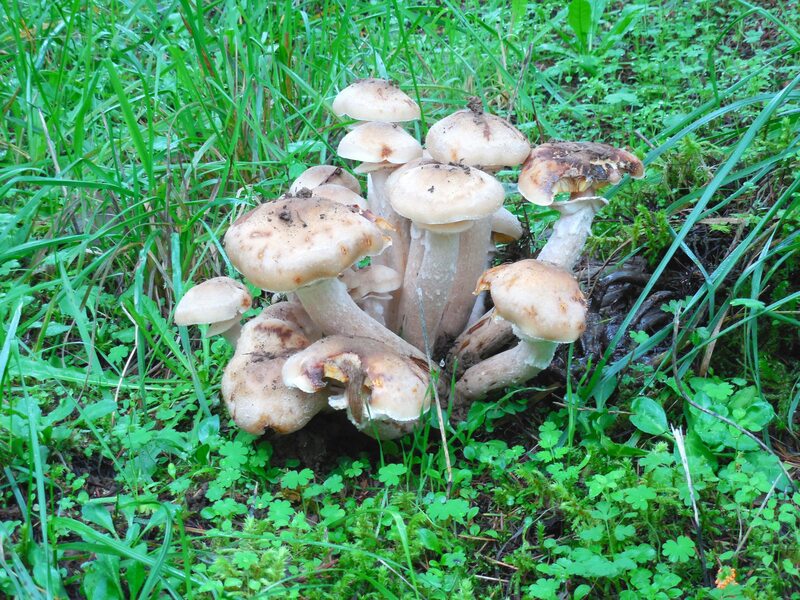 Many of the larger mushrooms that grew so lush and tidy after a few rainstorms, are now in bits and strewn all around. The local deer are known to nibble on mushrooms, and have spread the remnants all over. They are not tidy eaters, but then why would they be? Categories: Uncategorized | Tags: clump, deer, fir, mushroom, needles, Oregon, Oregon Convention Center, Portland, roots, seedling, stump, tree | Permalink. Today was a sunny fall day, the ground has been thoroughly moistened by rain, but it is still firm to walk on. A perfect day for transplanting. 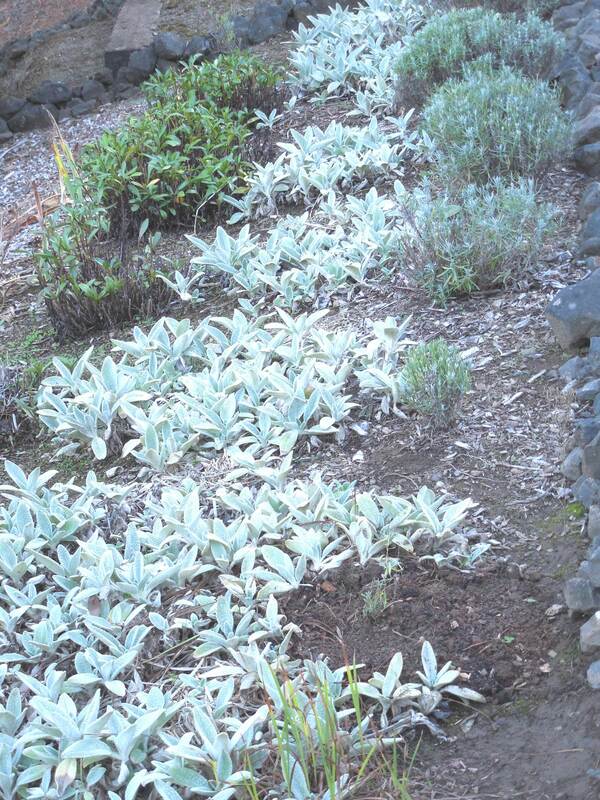 First off, I moved some Lambs Ear a great, drought-resistant ground cover. Next, I put some Lavender plants in to complete a row along side the driveway. In the lower right of the first photo, you can see a slim transplanted Lavender. This particular bed now has Lavender, then Lambs Ear, then Shasta Daisies, and on the outside are Irises. All of these plants are deer-resistant, thus there is no fence around them. An Oregon Grape shrub (not pictured) in the middle, is deer fenced, even though it is supposedly deer-resistant. My plan is to keep the Oregon Grape fenced until it is tall enough to withstand the deer nibbling. Now to the Foxglove. There was one plant within the deer fence and on irrigation. It put out an enormous amount of babies. I counted planting 76 of them. While I dug the Foxglove from within the deer fenced flower bed, I also dug up a number of Asters that had grown up in places I did not want them. Many of the rooted Aster starts are now in small pots to give away, but I cannot begin to keep up with them. The Foxglove was planted along the outside of a fenced flower bed. 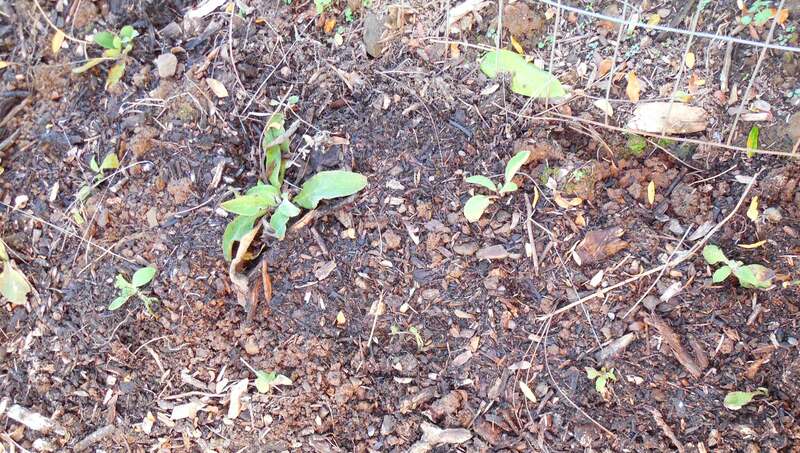 The second photo shows a few Foxgloves (I count eight) as they were planted. There are at least five plantings similar to this, besides other individual plantings. They should look very nice from the front deck by next summer. I am now learning to keep my flowers deadheaded to prevent an over abundance of progeny. Should I call it birth-control for perennials? 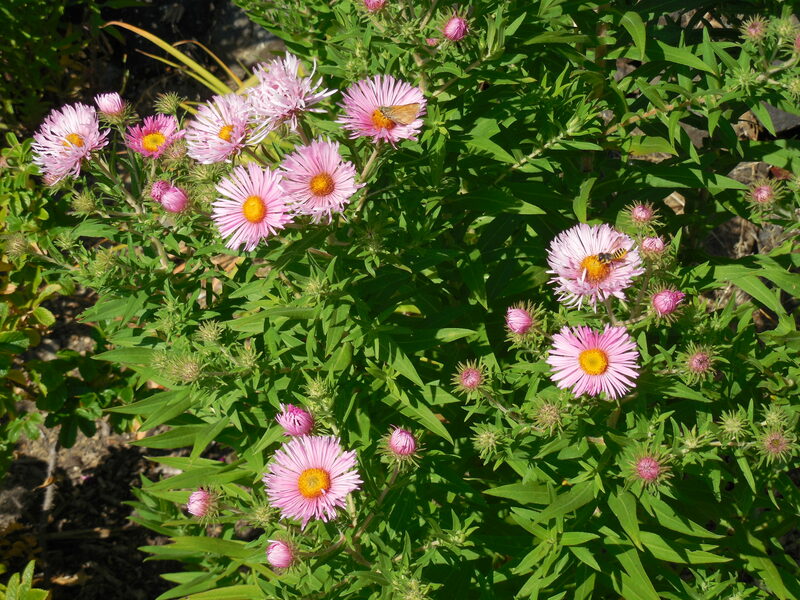 Categories: Uncategorized | Tags: aster, babies, birth, control, daisies, deadheaded, deer, foxglove, Grape, groundcover, head, lavender, Oregon, perennial, progeny, resistant, Shasta, transplant | Permalink. While this photo was taken July 1 this year, this plant is flowering again. 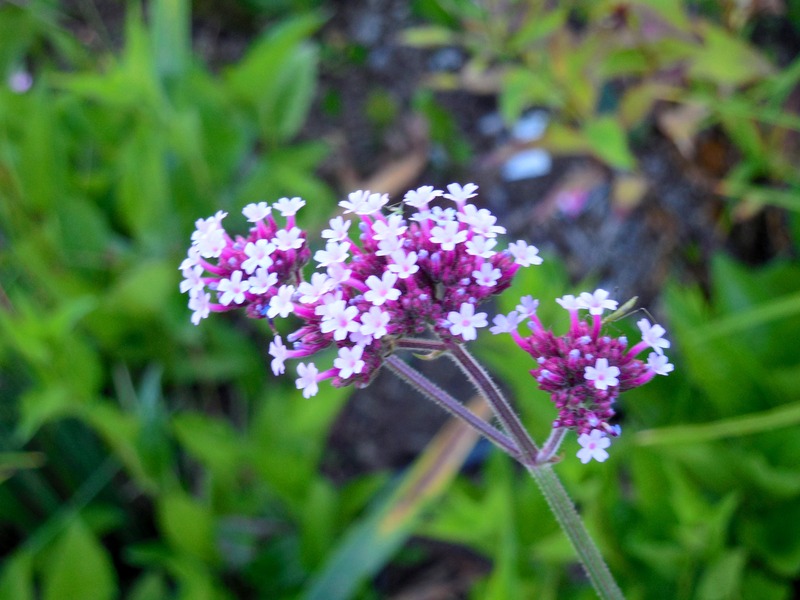 These flower stems are very long – about 3 feet tall (1 meter), yet the flower heads themselves are quite small. The one in the picture is 3 inches across, at most. And each flower head is really many teeny-tiny florets. I’ve only seen this flower in a public planting here in the Northwest US, one time, and it was more sparse than lush. One reason might be that it grows as an annual here in Oregon, but can naturalize in tropical climes, as Hawaii. But then you have to watch out, because it has become invasive some places. I try not to plant anything that can become invasive in my area. We are doing battle with enough unwanted plants, for example Himalayan blackberries (planted to control erosion) and English hawthorn (brought by early settlers for fence rows). Categories: Uncategorized | Tags: blackberries, control, English, erosion, fence, flower, Hawaii, hawthorn, Himalayan, invasive, naturalize, Northwest, Oregon, rows, teeny-tiny, tropical, verbena | Permalink. 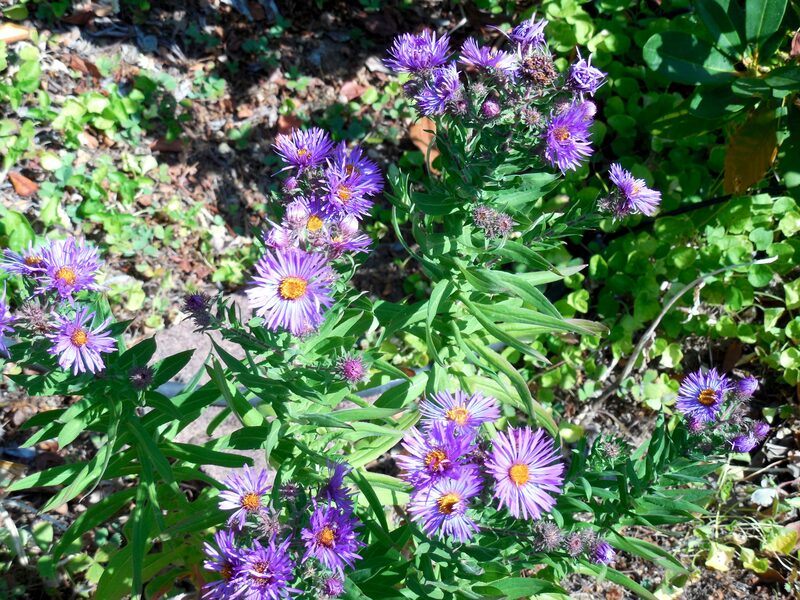 The first aster plant I bought, the purple flowered one in the first photo, looked a little sad in the discount section of one of my favorite nurseries, Down to Earth in Eugene, Oregon. A birthday present to myself. I would give it a good home and bring it back to life. How little I knew at that time. It seems these are very sturdy plants, as long as I keep them from the deer, and give them enough water. Oh, yes, and they like to multiply. So I moved the new plants around to different places in the garden. Flowers of the off-spring apparently do not have to be the same color as their parents, as I now have a variety of colors of asters growing. I have not seen the white flowered plant yet this year, but it may be still to come. In the second picture you can see a moth and a bee appreciating the blossoms. I am careful as I walk among these flowers, as I know the bees and wasps can be easily agitated as the season wears on. These make great cut flowers, and will keep on blooming if the stems are not cut too short. Categories: Uncategorized | Tags: aster, bee, birthday, blooming, blossom, colors, Down to Earth, Eugene, flower, moth, Nursery, Oregon, sturdy, variety | Permalink. 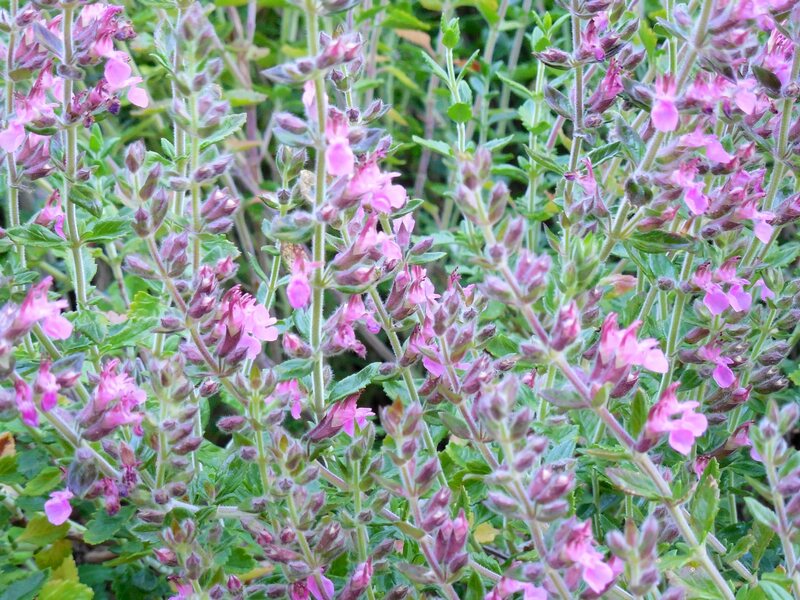 I believe this is a Hyssop, but it sure looks a lot like a Germander. One time I asked one of my favorite nurseries, Down to Earth in Eugene, Oregon, and they looked it up on the internet, and still it was hard to be decisive. The final conclusion was that it was Hyssop, but only by a nose. Bumblebees, the ones with yellow stripes across their black bodies, just love these flowers. The bees never bother me, they know what they are interested in. These perennials are so easy to grow. When I remember to cut them back in the dormant season, they come back so strong the next summer. The cut flowers make a beautiful addition to flower arrangements. 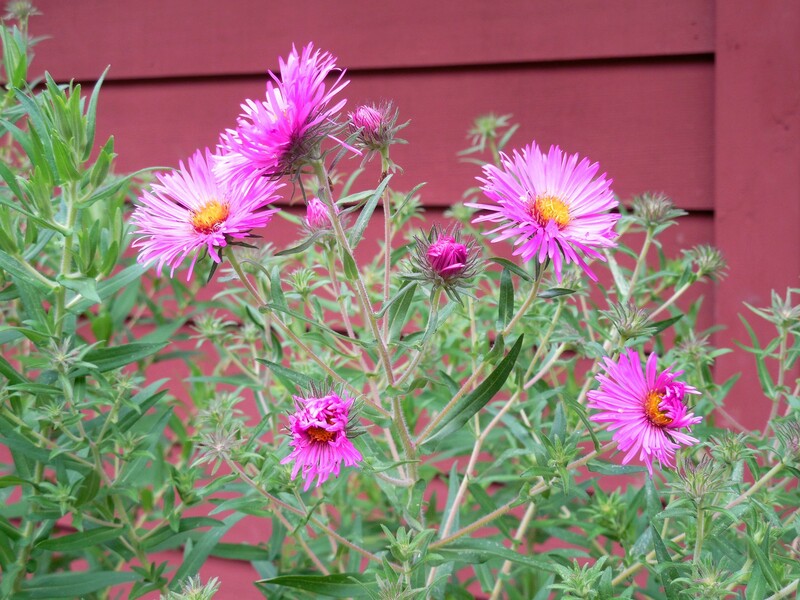 If you wait until late winter or spring to prune this plant, you give some time for the spent flowers to go to seed. The baby plants are so sturdy and reliable, they are worth the wait to watch them grow. Categories: Uncategorized | Tags: arrangements, bumblebees, Down to Earth, Eugene, flowers, germander, hyssop, k, Nursery, Oregon, perrenial, summer | Permalink. I like this picture as you can see the developing berries as well as the delicate flowers. Not only the stems, but the leaves, and even the backs of the leaves, have a multitude of thorns. Anyone who has gone berry-picking quickly learns how to pick these delicacies without getting too bloody in the process. 1 – Go early in the morning, so you can wear long pants and long sleeves without cooking yourself in the summer heat. 2 – Bring clippers to be able to cut a path to a desirable clump of berries. 3 – Have plenty of clean buckets for the picked berries. If you are picking berries to be cooked into pie or jelly, for example, as big as a 5-gallon bucket is fine. If you want to freeze or eat individual berries, a smaller size bucket is preferable, so as not to crush the bottom layers. 4 – Avoid berries on a roadside where they have accumulated car exhaust. Along a stream is a much better location for picking. Do know that you are competing with the local wildlife population, including birds, deer and bears, for your juicy berries? Categories: Uncategorized | Tags: beaver, blackberry, buckets, clippers, decimated, early, erosion, experience, flowers, freeze, Himalayan, history, invasive, jelly, leaves, long, mid-1800's, morning, Oregon, pants, picking, pie, sleeves, state, stream, tasty, thorns, wild | Permalink.